GREEN QUILTS Update, October, 1997. Turtle Moon Studios. Left: Robin Schwalb, Rhoda Cohen, and me, at the presentation of Rhoda's GREEN QUILTS Award for "Attachments." Left: "Attachments." by Rhoda Cohen. ©1996. 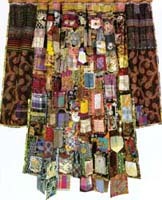 Selected for the 1997 GREEN QUILTS Award. 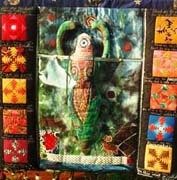 This quilt is in the Quilt National '97 exhibition. Rhoda Cohen recieved the 1997 GREEN QUILTS Award in an unofficial ceremony May 24, 1997, at a party at Hilary and Marvin Fletcher's house in Athens,Ohio, during the Quilt National opening weekend. Rhoda's quilt, "Attachments," was chosen by Robin Schwalb and me, from the pieces in Quilt National '97, as the quilt best expressing the GREEN QUILTS purpose. In 1995 this award was given to Melody Johnson. 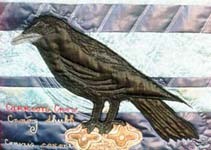 Works by Irish artist Bridget O'Connell have come into the GREEN QUILTS archives for several years. Jimmy and I met Bridget when she hosted us to teach a class in Sligo in 1994. She has incredible enthusiasm for the Earth and gaelic spirituality, and inspires many others with her energy, talent, and teaching. We're pleased to show you some of her works. Left: Detail of "Blessed Are the Piecemakers, for They Shall Be Called Daughters of the Goddess." ©1997. Bridget O'Connell. Sligo, Ireland. Left : Detail of ""Shape Shifter: Master of Illusion." ©1997. Bridget O'Connell. Bonnie Peterson-Tucker, of Elmhurst, IL, just emailed this news......."Hot off the press sotospeak! I got a 3 week artist in residency at Yosemite National Park this past summer! it was so wonderful, I love hiking so I took full advantage of the location and saw a ton of really great trails and mountains, streams and peacefulness! And now I am working on making some stuff from that experience! I am planning on making a lecture out of the experience."